Our magnetic studs are specifically designed to be worn anywhere on the lips, and ears. 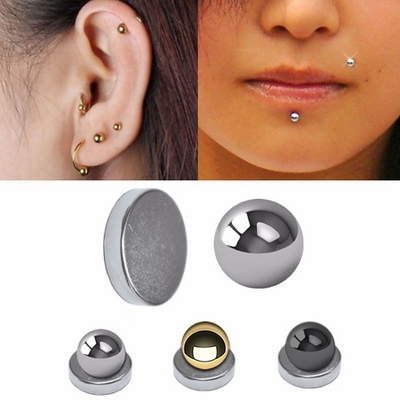 The unique backing magnet is strong, giving the effect of real facial piercing without the pain or permanence of a hole. Magnetic jewelry can be worn safely and comfortably not only on the ears, but also on the nose and anywhere around the lips. Simply place the thin backing magnet behind your ear, inside your nose, or between your lip and gum, then place the jewelry in front. The backing magnet and jewelry attract each other through the skin and hold each other in place. Q : Can this be used as a tongue piercing ? Would the magnetic s hold strong enough? Q : Is this able to he used as a cheek piercing? Not recommended since your teeth will often bite the backing plate.